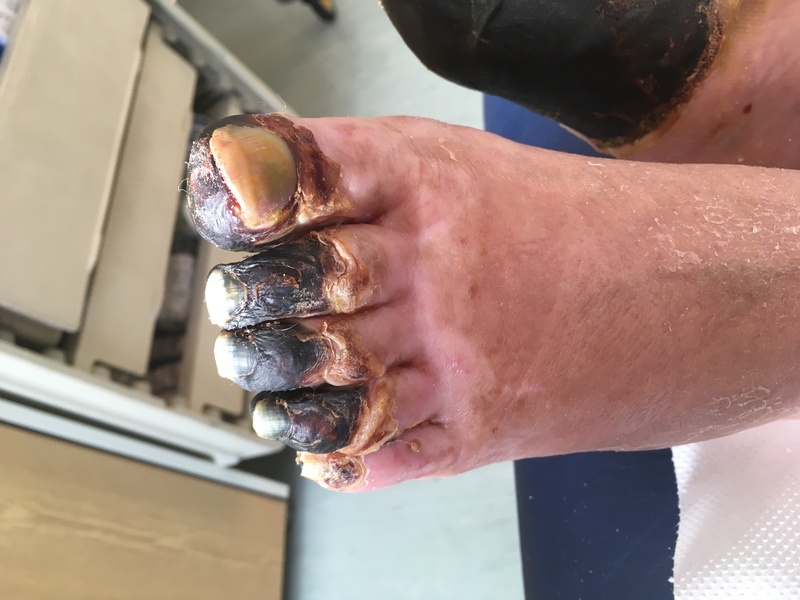 A 65-year-old man develops systemic peripheral gangrene (SPG) following hospitalisation for acute septicaemia and pneumonia. On admission, it was established that he was ten days into a course of Azathioprine, an immunosuppressant used in the management of Crohns Disease. Ischaemic changes to all limbs were noted one day after admission, consistent with disseminated intravascular coagulation (DIC). 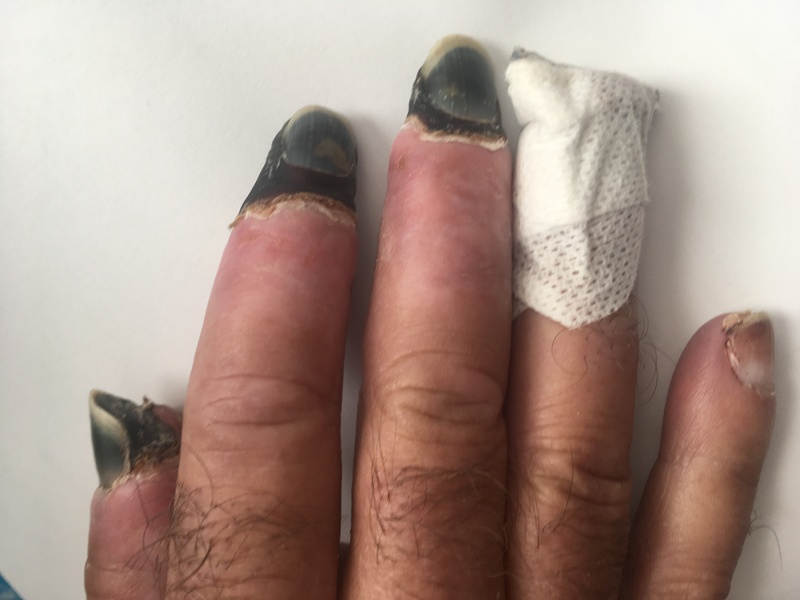 He is kept in an induced coma for ten days, but on recovery, discovers necrotic and gangrenous changes to all hands and feet. At an initial a surgical consult, he is advised that it is likely he will require both feet and hands to be removed. He remains in hospital under observation for a further three weeks, at which point, the demarcation line is mid calf and above wrist in the respective limbs. A further surgical consult confirms bilateral BK and above wrist amputations, but surgery is delayed until he makes a full recovery from the sepsis. On discharge from hospital, he commences a seven-day one-hour course of Hyperbaric Oxygen Treatment (HBOT) at 2.2 atmospheres of pressure with 100% oxygen. 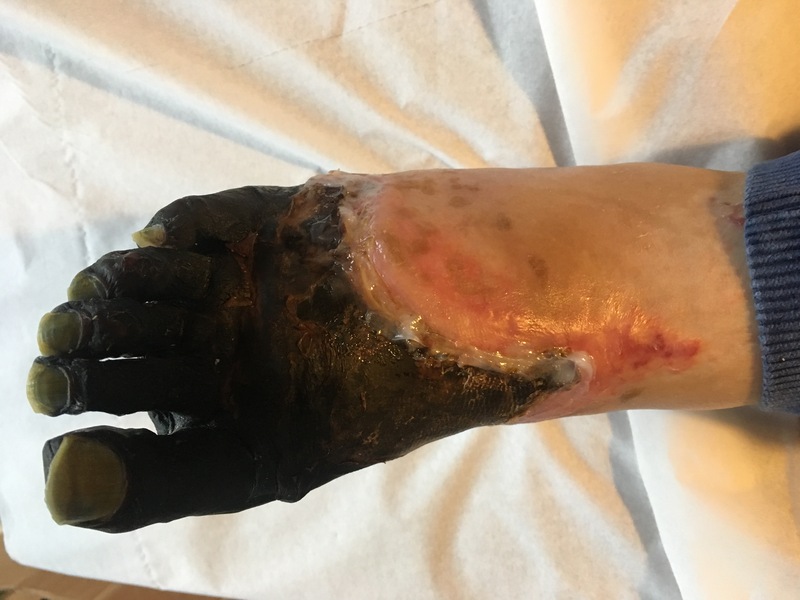 At the conclusion of the seven-day course, re-vascularisation of all limbs was achieved and over the following month, there was rapid sloughing and granulation to many areas of gangrenous and necrotic skin. Three months after discharge, there remains dry gangrene to the right forefoot, and the end of the three middle toes on the left foot. The terminal phalanx of two fingers on the right hand are also unrecoverable. His surgical prognosis, is however, substantially improved, with only the right foot requiring salvage beyond the toes. There isn’t any published literature that details the use of HBOT for SPG following acute systemic infection like sepsis or meningitis, but I recall being told of a similar case over four decades ago following an abdominal puncture wound to a diver during sub-sea installations in the North Sea. Subsequently he developed septicaemia with resulting ischaemia and SPG in all limbs. He remained in decompression during his treatment and rapidly made a full recovery with no limb or even tissue loss. Over the last four decades, the use of HBOT in a variety of medical conditions is becoming more widespread, particularly with ischaemic conditions such as cerebral palsy, strokes, diabetic and neurovascular foot and leg ulcers, where increased blood flow and oxygen perfusion can improve outcomes significantly. Whilst I appreciate that n=1 is no basis to claim vascular recovery can be achieved in all cases of SPG by commencing a course of HBOT at the earliest opportunity, it is surely worthy of consideration. Limb loss following septicaemia and meningitis is a life changing experience for the survivors – and a huge cost to the NHS in continuing care. The gentleman referred to in this post was not a patient, but a friend of mine – a very good blues guitarist from Blackpool, who thankfully will be able to play again sometime soon – and drive himself to gigs. For others, the road is much more daunting. So, to any vascular or sepsis specialists out there with responsibility for managing someone with SPG following septicaemia or meningitis, it may be worthwhile considering HBOT as a preferred option for limb recovery in these tragic cases.